The most notorious monument of Roccalbegna is the Church of the Saints Peter and Paul (XII-XIV century) in the central square, overlooked by the town council building and by the small civic tower with the sundial. 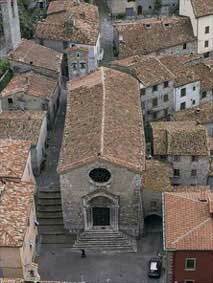 Its facade is covered with travertine slabs and has a Romanesque rose window and portal. The portal, sided by spiral pillars with ad Agnus Dei decoration above the crown of the arch and two human faces at the capitals, is inclined toward the right due to the sunken ground. The fresco which adorns the lunetta depicts the two patron Saints. A triptych of Ambrogio Lorenzetti (1340) depicting Saints Peter and Paul with the Virgin Mary and Child is kept above the higher altar inside the church with one nave. Other religious works of art are represented by the christening font in white marble (XVI° century), the fresco of the Madonna della Misericordia with Saints Fabiano and Sebastiano (1476), a large wooden Crucifix of the XIV century and a Crucifixion attributed to Francesco Nasini.